Cravings: Pickles and peanut butter with toast. I've been having exactly that each morning. The pickle is for the third trimester morning nausea, and I'm craving peanut butter probably because of the protein in it! Oh, I'm still eating apples too. Reactions: Someone who I don't know very well mentioned that I look like I'm about ready to pop. I didn't appreciate that one so much at all. 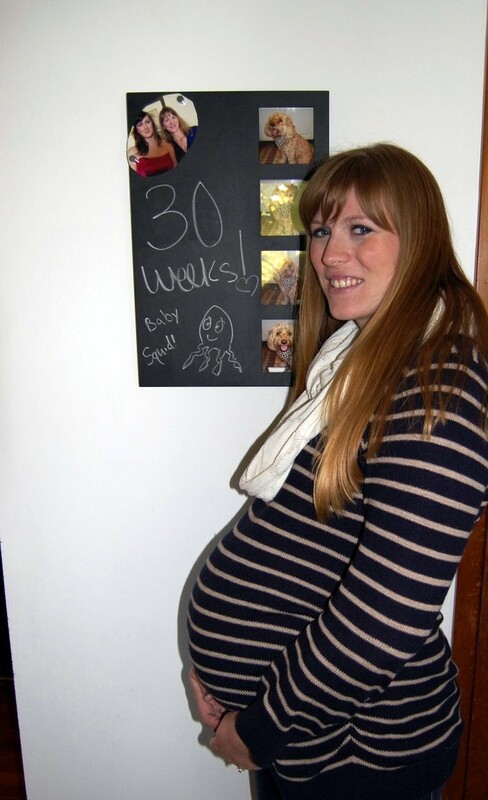 I'm 30 weeks not 40 weeks. Favorite moment this week: My favorite moment? Probably when my doctor told me that it doesn't matter what position the baby is in till week 36. I was relieved when she said that! No need to worry or think about that for now. General Mood: Anxious and Happy. I'm anxious to meet our baby and to have a break from being pregnant! Things I was surprised by: I'm just under 6 weeks away from having weekly doctor visits. I can't imagine going every week. I keep feeling like I'm really getting close to the end even though there are 10 weeks to go. The baby's movement is getting much more intense when he kicks! He's getting stronger and bigger, and I love it. We can't wait to meet you, Liam! Things I'm most looking forward to: I'm very much looking forward to my sister coming home in November! I cannot wait to see her and hang out. It's been over a year since we have seen each other! Plus, when she gets home, I'll be 2 weeks away from giving birth! It will be a very exciting time for our family. Sleep: Sleep is getting more uncomfortable as I'm getting bigger. My hips and back are starting to ache, and I dread waking up in the morning because I'm nauseous. I'm learning to get up anyway and eat a pickle right away. It helps so much! What I think is really cool and amazing: My bump measured at 33 centimeters this week. I'm at the bigger end of normal, and I'm wondering if the baby's birth weight will reflect that. Maybe we'll have an 8 lb. baby? That's my guess for sure. Food aversions: None that I can think of right now. Maternity Clothes: I'm loving the new winter clothes I got while I'm pregnant. They're comfortable and fit so well. Macy's has been my favorite place to shop for maternity clothes. They have a small selection, but everything they have is high quality. They also have pretty good sales/deals. Exercise: I'm still exercising. I'm doing my favorite exercise video 1 to 2 times a week, and the rest of time, I'm walking or doing a few exercises at night that help ease the aches and pains. I'm loving my walks with Kittle. Although, this week, I went for a walk earlier in the day when it was sunny, and I got a migraine a few minutes after coming home. I should have known to go later or wear sunglasses. I got a migraine before from washing my car in direct sun light in the morning. Not good!